Last Friday, Democrats in the US House and Senate, including Georgia Reps. John Lewis and Hank Johnson, filed the Voting Rights Advancement Act of 2015. This legislation amends the Voting Rights Act and modernizes the formula that determines which states must submit changes to their voting laws for preclearance by the Department of Justice. The previous formula, contained in Section 4 of the voting rights act, was ruled unconstitutional in the 5-4 Shelby County v. Holder Supreme Court decision in 2013. Since that ruling, many states that were previously covered by preclearance have instituted more restrictive voting laws. Notably, North Carolina dramatically changed their voting rights law after the decision, instituting strict voter ID requirements, slashing early voting, and eliminating same-day voter registration. Georgia lawmakers requested a study in February in the amended FY 2015 budget to examine “why [State Health Benefit Plan] SHBP’s costs are higher than other comparable government employee health plans.” The study, conducted by Aon Hewitt on behalf of the Georgia Department of Community Health, is out, and you can almost see the teachers nodding in agreement. It found that Georgia teachers and other state employees are paying 29% more for their health insurance than the average employee enrolled in comparable state plans – or 17% higher when adjusted for state cost levels, demographics, and number of dependents on each plan. The study compares the SHBP to state health plans from Florida, Kentucky, Mississippi, South Carolina, Tennessee, and the separate Board of Regents plan. When looking at average overall plan costs per employee, including employer subsidies, the SHBP ranks 2nd most expensive, with costs 11% higher than the mean. Aon Hewitt finds three main drivers of this high relative cost versus other states: that healthcare is more expensive and utilized more often in Georgia, that SHBP recipients are older and more female, and that SHBP recipients have more dependents on their plan. Once these factors are controlled for, the study finds that Georgia’s total costs per employee are actually 1% lower than in comparable states. The study can’t, however, control away the costs that teachers and other state employees directly bear – their payroll deductions for premiums and out-of-pocket costs. SHBP enrollees face the highest unadjusted employee cost of all the comparable plans studied: 29% higher than the mean. Even employees who fully participate in the plans “wellness incentives” and don’t use tobacco face higher unadjusted costs than the average participant in all other comparable plans: 23% higher than the average of all plans. When adjusted for the location, demographic, and dependent factors mentioned above, Georgia employees have the second highest employee cost of all comparable plans and end up paying 17% higher than the mean. The report offers ten options to lower costs. Most focus on ways to reduce total plan costs, such as implementing telemedicine options, setting up on-site health clinics for teachers, or moving to narrower networks of doctors. However, some key in on the bigger problem for the SHBP: the employee share of costs. Since Georgia passes off more costs of SHBP to its employees than comparable states, one option offered is for the state to increase its employer contribution to better match its peers. With Georgia’s tax revenues up year-over-year, you can bet that teachers groups will be pushing hard for some of these new revenues to be put towards this option. How Many of GA’s 541,000 ACA Marketplace Enrollees are from Your County? The second round of open enrollment in the “Obamacare” health insurance Marketplace established by the Affordable Care Act has closed, and roughly 71% more Georgians signed up than last time around. This means over 541,000 Georgians are now enrolled for insurance through the ACA, and approximately 90%, or 486,900 of them, qualify for tax credits. After these tax credits, the average monthly premium is just $73. The AJC talked to health care experts about the skyrocketing enrollment, and major increases are being seen in many states who have not expanded Medicaid. Of course, not everyone that would be eligible for Medicaid can move to the Marketplace with federal tax credits. Instead, an estimated 300,000 Georgians are uninsured but don’t make enough money to qualify for Marketplace subsidies. I’ve pulled together some maps to show where these enrollees are coming from. McIntosh County leads the way with 11.44% of their population enrolled through the Marketplace, while only 1.04% of Chattahoochee County is using the ACA Marketplace (actual numbers could be higher, as zip codes with fewer than 50 enrollees aren’t included in this data). Click through on the map to view multiple interactive versions. You’ll see that while raw enrollments are concentrated in high-population metro areas, plenty of non-metro counties have seen a sizable percentage of their population enroll. Low-percentage enrollment counties are concentrated in South Georgia. Interestingly, this enrollment isn’t significantly related to counties’ Democratic voteshares – GOP lawmakers should note that this isn’t a case of only Democratic strongholds signing up for Obamacare. Many lawmakers are holding the line and attempting to obstruct the ACA in any way possible, despite their constituents’ participation. When he talked to the AJC, Rep. Jason Spencer (R-Woodbine) pledged to “fight Obamacare as long as I am in office.” Around 1 in 25 people in his home county have enrolled for health insurance through the ACA Marketplace. These maps also give perspective to the potential impact of King v. Burwell, the court case to eliminate ACA subsidies in states that don’t operate their own health exchanges. If the Supreme Court sides with GA Attorney General Sam Olens, 90% of these 541,000 will suddenly face massively more expensive health insurance bills. Providing this estimated monthly income would increase the ease of planning for retirement. Putting one’s account balance into a more relatable number could also encourage individuals to save more, as they would know how their seemingly large lump-sum savings would spread out over their retirement. A wide variety of the political spectrum agrees with this idea – this bill’s 2013 iteration counted Senators Elizabeth Warren (D-MA) and Tim Scott (R-SC) as co-sponsors. If passed, it would follow a trend of increased disclosures for defined-contribution accounts. Department of Labor action in recent years has led to increased fee transparency on 401(k)s, which is crucial for building a solid retirement nest egg. If you have a 401(k), you might want to head to your annual statements and check the fees on your investment options – a seemingly small fee difference could be costing you tens of thousands of dollars over your lifetime. I’ll be graduating from the University of Georgia this Friday, and I know my four years in Athens have helped me out enormously. Unfortunately, a new study from Raj Chetty and Nathaniel Hendren shows that Athens-Clarke County has the opposite effect on poor children – living in Clarke instead of the average county is detrimental to their long-term success. In fact, Clarke ranks 26th among 2,478 counties for the lowest-level of upward income mobility among poor children. A poor child growing up in Clarke compared to the average US county would make over $4,000 less at the age of 26. 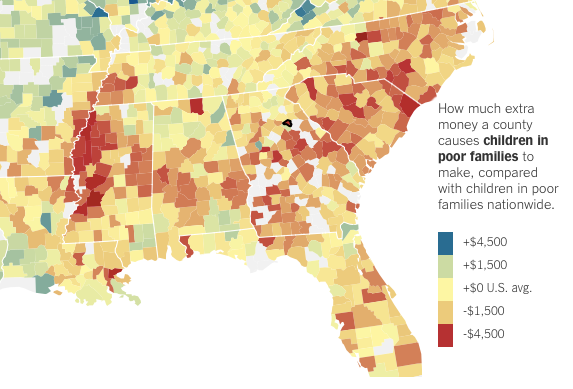 Unfortunately, nearly all counties in Georgia (and throughout the South) show negative impacts on poor children’s outcomes. You can check the interactive map from the New York Times for yourself here. Of the nation’s 100 largest counties, Fulton County ranks 12th worst for income mobility. Fayette and Henry counties are the stars of the metro area and the state, though – poor children in Fayette do 11% better than average, while in Henry poor children end up with 2% higher incomes. Chetty’s study uses tax records to find individuals that have actually moved between counties. Because of this, they can estimate that between 50-70% of intergenerational mobility across “commuting zones” and counties is due to the “causal impact of place.” Each additional year that a child spends in a county has roughly the same impact on their future earnings. This means that the sooner poor children move to a “better” county, the more time they have for its positive benefits to accrue. Chetty and Hendren identify common characteristics of what makes counties better for children’s long term outcomes: lower rates of residential segregation by income and race, lower income inequality, better schools, lower violent crime rates, and more two-parent households. These characteristics don’t stand alone – it’s easy to see how they can interact with each other. Highly segregated areas hurt the outcome of boys more than girls. Reducing this segregation wouldn’t just help poor individuals, though. The authors note that increased segregation and inequality doesn’t help, and likely hurts, children from above-median income families as well. An accompanying study looks at experimental housing vouchers that allowed poor families to move to better neighborhoods, finding that kids that moved before turning 13 using this program had 31% higher incomes. Not everyone is able to move away to chase better outcomes, though, so focusing on improving our communities at the local level is incredibly important. As we reported last week, students at universities across the state will face another big tuition hike for the 2015-2016 school year, with schools including UGA and Georgia Tech facing a 9% increase. HOPE award amounts, though, will only increase by 3%. The Augusta Chronicle has crunched the numbers and found that UGA’s tuition and mandatory fees have increased from $3,276 per year in 2000 by over 3.5 times – students next year will pay over $11,600. While tuition and fees have skyrocketed, the below graph shows that changes to the HOPE scholarship have caused receipients to pay an increasing part of cost of attendance out of their own pockets. Claire Suggs with the Georgia Budget and Policy Institute calculates that a UGA student’s HOPE award will now only cover 74.5% of tuition. 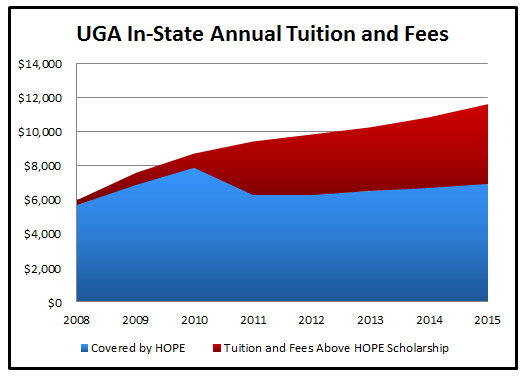 This understates the challenge for HOPE recipients, though, as UGA charges $2,258 in mandatory (non-HOPE covered) fees per year. 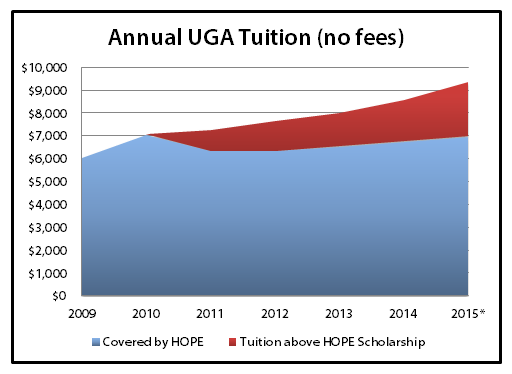 Taking fees into account, the HOPE scholarship now only covers 60.1% of the tuition and fees at UGA. The Board of Regents just announced University System of Georgia tuition for the upcoming 2015-2016 school year, and many Georgia students face larger percentage hikes than last year. While last year 27 institutions saw their tuition increase just 2.5%, this year only 20 colleges and universities will face the minimum 2.5% hike. That leaves 10 institutions with larger hikes. Students at the University of Georgia, Georgia Tech, Atlanta Metropolitan State College, and Middle Georgia State University will see a 9% increase – while last year only Georgia Tech saw that high of a jump. Georgia Gwinnett College is up 8.3%, Georgia Regents and Georgia State are up 5.5%, University of North Georgia is up 5%, and Kennesaw State is up 4.4%. For context on these rates – this means UGA in-state annual tuition will increase by $773. The hikes come after Georgia’s FY 2016 budget increased USG funding by 4% – most of which will go to health insurance and retirement costs. Like recent years, these tuition increases allow USG to balance cost of attendance at roughly 50/50 between state funding and tuition – down from a pre-recession 75/25 split with the state covering most costs. That same budget increased the HOPE scholarship award amount by just 3%. Alongside tuition hikes, students will also face an average 3% increase in student fees. USG Vice Chancellor for fiscal affairs John Brown points out that these rates are “some of the lowest” when compared to peer institutions, and that USG four-year institutions rank 7th cheapest among the 16 states on the Southern Regional Education Board. Around $326 a Vote – Was New Georgia Project the Best Bang for the Buck? “I cannot imagine having delivered a better outcome given our objective,” House Minority Leader Stacey Abrams told the AJC in a new interview on the New Georgia Project, the voter registration group she established in late 2013. The objective? Registering 120,000 new minority Georgian voters before the 2014 midterm elections. The outcome? Not even close. U.S. Representative John Lewis has reintroduced H.R. 12, the Voter Empowerment Act of 2015, and Reps. Sanford Bishop, Hank Johnson, and David Scott have joined as original co-sponsors. This bill would standardize and strengthen election requirements nationwide. Major new requirements include online voter registration (as Georgia introduced last year), early-voting for at least 15 consecutive days prior to Election Day, same-day voter registration (which greatly increases voter turnout), and paper trails for electronic voting machines. The bill would also restore voting rights in federal elections to felons who have finished their sentences, ending disenfranchisement laws that disproportionately harm minorities. “Even if the days of poll taxes, literacy tests, and brutal physical intimidation are behind us, disenfranchisement tactics that aim to suppress voter participation are alive and well. The Voter Empowerment Act eliminates such divisive barriers separating voters from the ballot box and takes advantage of modern technology to bring our elections into the 21st Century,” concluded Bishop. Lewis’s bill would guarantee that more Americans are able to exercise their right to vote. At present, its 170 co-sponsors in the US House include no Republicans. The state of Georgia is preparing to execute Kelly Renee Gissendaner at 7:00 PM on Monday, March 2nd. If this continues as planned, her execution will be Georgia’s third of 2015 and our first execution of a woman in 70 years. While serving time in prison for the murder of her husband, Gissendaner studied theology through a program run by a partnership of Atlanta schools including Emory’s Candler School of Theology. The New York Times wrote last week of Gissendaner’s experience and transformation through her studies and Christian faith along with her development of an unlikely friendship with the with the German theologian Jürgen Moltmann. In Ms. Gissendaner’s clemency petition, which includes detailed testimony from inmates and former wardens, one guard discussed her calming effect on women who were suicidal or had mental illnesses. Georgia’s Board of Pardons and Parole has denied Gissendaner’s clemency request. This board is the sole source of pardons in the state – Georgia’s governor does not have the power of clemency. Nonetheless, hundreds of Georgia faith leaders are calling for mercy and have issued an open letter asking for commutation of her sentence to one of life without parole. The letter notes that Kelly has prevented other inmates from taking their own lives on multiple occasions and quotes a correctional officer who stated that “her witness has been an amazing beacon in a very dark place.” Barring a surprising reversal, our state will end that witness Monday. Prior to 2013, Medicaid paid doctors on average nationwide only 59% of what Medicare would pay for primary care services, which itself pays less than what doctors typically bring in from private insurers. With the goal of increasing access to health care in mind, the Affordable Care Act provided a federally-funded temporary bump for Medicaid to 100% of Medicare primary care reimbursement rates from 2013 to 2014. These boosted payments have now expired, and the AJC reports that doctors are concerned about the impact this will have on access to care for Georgia’s Medicaid patients. Since 1.8 million Georgians, including 43% of Georgia’s kids, get their health insurance through Medicaid, this is no isolated problem. Senator Renee Unterman (R-Buford), chair of the Health and Human Services Committee, supports addressing this payment drop-off and will be holding a hearing this Friday on the issue. “We’re not just talking about poor people here. We’re talking about insurance holders who won’t be able to find doctors in their county because the doctors will have left,” Unterman said. If the state does not act, Medicaid primary care payments will drop by 35% back to what Georgia paid to doctors in 2012: 65% of the amount that Medicare pays. Neighboring states Alabama and South Carolina have filled this funding gap, so it’s not inconceivable that Georgia could act. Keeping the boosted rates would cost just over $60 million in state dollars in FY 2016, which would bring in over $125 million in federal funds. A recent fiscal note shows that raising the tobacco tax by $1.23 to the national average would bring in around $570 million annually, and at least one health care lobbyist has pointed to this potential revenue source as a way to boost provider payments. A rough estimate based on this fiscal note shows that only $0.13 more per cigarette pack (and its tobacco equivalents) would allow the state to eliminate this funding drop-0ff. This means there’s room for a tobacco tax hike that solves this problem while leaving plenty of new revenue for other state priorities. Senator Josh McKoon (R-Columbus) has filed the hotly-anticipated Senate version of a bill supporters claim is necessary to protect religious freedom in our state, SB 129. McKoon’s “Georgia Religious Freedom Restoration Act” is a counterpart to Rep. Sam Teasley ‘s (R-Marietta) “Preventing Government Overreach on Religious Expression Act,” HB 218. The AJC notes that McKoon’s bill counts 28 additional Republicans among its supporters, so it already enjoys majority support in the Georgia Senate. McKoon often points to the fact that many states have adopted state-level RFRAs after the US Supreme Court ruled that the federal RFRA did not apply to the states as reason to support his bill. However, in some cases this bill’s language goes beyond both the federal RFRA and Teasley’s HB 218. McKoon’s definition of “exercise of religion” specifically includes “the right to act or refuse to act in a manner that is substantially motivated by a sincerely held religious belief.” This language is absent in the federal RFRA, which only covers “exercise of religion, whether or not compelled by, or central to, a system of religious belief.” This language, viewed in light of calls to support state-level RFRAs to protect business owners refusing to provide services to LGBT individuals, seems to give credence to concerns about state-level RFRAs being used as a defense of discrimination. “While Ms. Lynch may have an impressive resume, she did not adequately answer the committee’s questions nor alleviate my concerns about the consistency with which she applies our nation’s laws. After thoroughly reviewing her record and testimony, I am not confident she will defend the Constitution, especially when the President seeks to abuse his power. Lynch is expected to receive Republican support on the Judiciary committee. Senators Orrin Hatch and Jeff Flake have announced their support, and Senator Lindsey Graham is expected to vote in her favor as well. It’s worth noting that Lynch’s belief in the constitutionality of Obama’s immigration executive actions is far from an extreme position – in fact, a panel at the conservative Federalist Society last November generally conceded that the president is acting within the law and Constitution. The Center for State and Local Finance at Georgia State University recently issued a report on trends in Georgians’ student loan debt, and the results aren’t pretty. 33% of 25-year-old Georgians now hold student loan debt, more than triple the amount of Georgians in 1999. This number has previously been about 5-6% lower than the national average, but the gap has grown smaller in the past two years while HOPE recipients and awards have declined (as the cost of attending USG schools rises dramatically). Of the 25-year-olds with student debt, the average amount owed has also grown dramatically from $8,149 in 1999 to just over $25,000 in 2013 – right at the national average. Interestingly, four-year college graduates in Georgia hold over $3,000 less in student loan debt than the national average – which the report notes could be due to college completion rates, for-profit colleges not being included in the four-year college graduate data, and that graduates are more likely to have received the HOPE Scholarship. Post-recession, this student loan debt appears to be holding back the Georgia market for homes and vehicles. Before the recession, more Georgians with student loan debt took out auto loans and mortgages than the national average. During the recovery, however, the proportion of Georgians with student loan debt buying houses and cars has dipped below our nation as a whole. As Jon reported, Rep. Tom Kirby introduced his “Georgia FairTax Bill,” H.B. 208, in the House Wednesday with visiting members from Georgians for Fair Taxation in attendance. The FairTax is meant to replace income taxes with consumption taxes. Putting aside Fairtax issues of regressivity, there’s a bigger problem with this bill. While it meets the “raise consumption taxes” test, it fails to actually eliminate the income tax. That’s right: Rep. Kirby and his fellow Georgia GOP co-sponsors have put forth a bill to raise the Georgia sales tax to 7.5% while not dedicating a single section to repealing the state income tax. When you consider how much our sales tax brings in, this means Georgians would face a nearly $5 billion tax increase if H.B. 208 was signed into law as-is. Maybe keeping the income tax was in response to Charlie’s column on how high “FairTax” rates would have to be to still fund our state? But now that some Georgia Republicans have filed a nearly $5 billion tax hike, it’s fair to say that there’s some room for compromise here. There are less dramatic options to raise enough annual revenue to fully fund K-12 education, expand Medicaid, and put some brand-new revenues behind transportation. Fully-funded schools, half a million more insured, and improved infrastructure – not bad at all for a fraction of the cost to taxpayers as Rep. Kirby’s bill!